Whether you are a veteran or novice tradesman, you must at one point have used a bubble level in your job. Builders have been using it for centuries. How can you level something when there’s no surface in the first place to set a level; the surface is uneven, or there is a great distance between two points of interests. This is where modern technology comes in the form of lasers. Laser levels supplement old techniques and enable builders to determine angles of elevation between two distant points very fast. These tools help create consistent foundations even in places where the ground level is uneven. 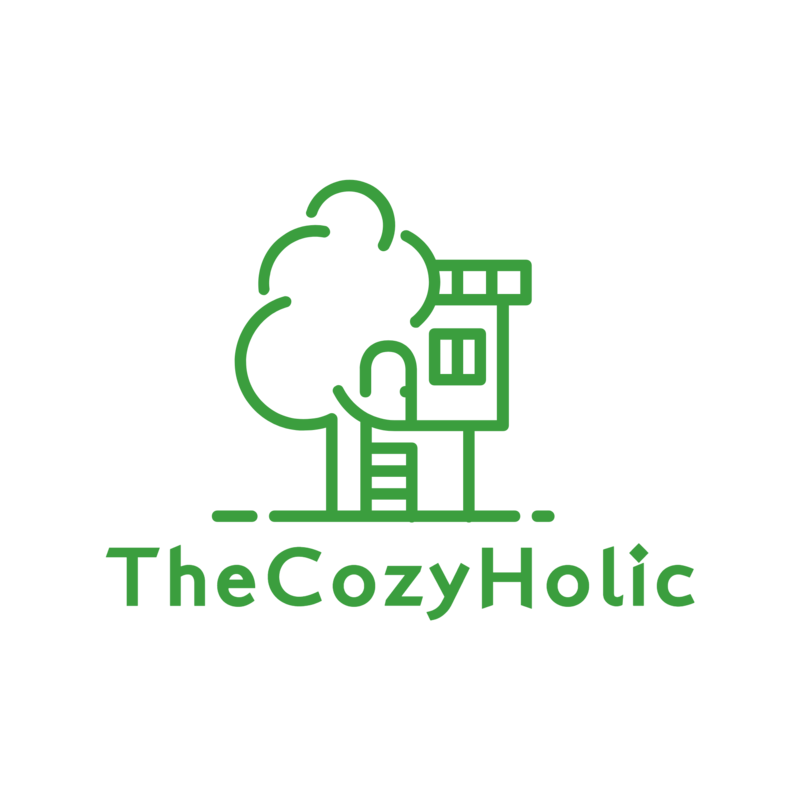 In this review, we will talk about the best rotary laser level in 2019, particularly how to choose one. Then we will outline 6 models which we have tried and tested ourselves. In the end, we will let you know the one that offers the best value for your money. In construction and surveying, a laser level is a control tool featuring a laser beam projector which may be attached to a tripod stand. 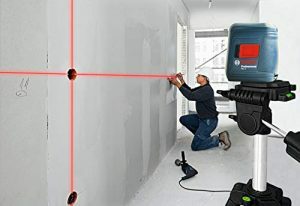 A laser level with tripod projects a green or red beam that identifies the accuracy of a horizontal or vertical surface. It is more advanced than a bubble level because it spins a beam across a 360⁰ plane. This method not only creates a single level line, but also a 2 dimensional level plane. The projector uses a rotating head consisting of a mirror to sweep the beam round a an axis. In case the mirror doesn’t self-level, visually readable vials are used in conjunction with adjustable screws to calibrate the projector. The device has a staff with a movable sensor the user carries. The sensor detects the laser and indicates whether the sensor is aligned with the beam with a beep. The sensor positioned on the staff is referred to as the story pole or a grade rod and is used to compare different elevations at different points. There is a huge selection of self-leveling rotary lasers out there, making it difficult to decide which model to purchase. Perhaps you don’t have time to research different models and want professional advice before shopping for the best rotary laser level. That is why we want to explain the best features of a product that suits your needs. First, determine the type of work you will undertake. Will you be working indoors, outdoors, or both? Maybe you want to install fence posts, chair rails, underground pipes, or grade a construction site. These are the factors you should determine before shopping for the best rotary laser level for home use. But that’s not all. You need to learn about the best features of a rotary level. Here is a rundown. If you are working on a big project, the range should be a major consideration. Most rotary laser levels have a range between 1000’ and 2000’ The higher the range, the higher the price becomes. Note that the range is directly proportional to accuracy, so you might want to choose a level with a higher range. This is especially true if you want to mark long distances which requires a high degree of accuracy. A rotary laser is identified by its accuracy. Distance is a factor when determining accuracy. Some have a range of about 30’ while others go up to 100’. When making a selection, you will find accuracies ranging from 1/8” at to 1/16” (high-end models) 100 ft..
We all know a job site is a rugged environment and requires sturdy working tools. A self leveling rotary laser level kit is likely to be tipped over so its construction matters a lot. The spinning diode on the tool is one of the most delicate parts and needs to be protected from potential damage. When shopping, find a model with a built-in defense mechanism such as rubber bumpers for absorbing impact. Periodically take it for servicing and re-calibration. Some rotary levels feature batteries with longer hours of life, say 85 hours while others have a short life. The lifespan of the battery matters to some. If you work in remote places or for long hours, it is recommended to get the best rotary laser with a longer battery life. The batteries should be rechargeable so you don’t spend too much money replacing them after use. This is the first you should know from these self leveling rotary laser level reviews. The application of a motorized rotary laser level kit is not limited to determining the elevations. Other uses include, tile installation, surveys, masonry alignment, contour farming and drainage, stonework floors in outdoor kitchens, leveling decks, level framing in new construction or remodeling projects, in-ground fiberglass installation in swimming pools, leveling windows, doors, and sills, hanging artwork, leveling foundations, etc. What kind of job do you have in mind? You should determine whether you need a remote control and if the laser level rotary has a 360⁰ capability. If your project is based indoors, ensure the beam is bright enough to mark your surfaces. On many job sites, rotary levels are subjected to harsh environmental conditions. A laser level for home use isn’t as vulnerable to much abuse. If you will be working on a commercial job site, find a model that can take a beating. Most manufacturers provide a storage case to make the self-leveling rotary laser level easier to carry. Consider a storage case the first line of defense against environmental abuse. Ensure that the case is made of durable materials such as aluminum. For enhanced protection, check if there is a rubber cover for impact resistance. The rotary laser level kit is built to last. However, it is good to choose a tool with the most robust warranty. Even if it seems like heavy-duty equipment, it is also a high-tech precision device that requires protection. So, the longer the warranty period, the higher your satisfaction will be. A rotary level has a transmitter and a receiver. The transmitter is mounted on a tripod while the spinning diode emits the laser beams. The receiver is mounted on a transit/grade which is basically a large ruler that detects the laser to signify whether it is lower or higher than the beam. High-end transmitters are self-leveling at a range of 4 ⁰ – 5⁰. On the other side, cheap transmitters use bubble levels because they need to be leveled before projecting a laser. In this guide, we will focus more on self-leveling rotary laser level reviews. Most people know about red lasers. However, recent technology has led to the production of green rotary laser which has more merits such as more visibility making them great tools for working indoors. Plus, it cannot work in freezing climates and will cost you more than the red counterpart. Even though it consumes a lot of power, a green rotary laser level gives remarkable visibility. This is commonly referred to as the IP code which is an international standard of gauging the level of protection against water, foreign objects, and electric shock in an electronic instrument. The IP value has two numbers indicating protection against foreign objects (dust) level and a second number for protection against water. For example, an IP rating of IP68. ‘6’ represents foreign object protection while ‘8’ is the protection against water. The higher the IP value, the better the rating. Look for higher Ingress Protection Rating if your job involves damp and busy conditions. In case your laser gets wet, dry it off as fast as you can to avoid damage even if it has a higher IP. Many professionals use a tripod stand to mount their rotary lasers. 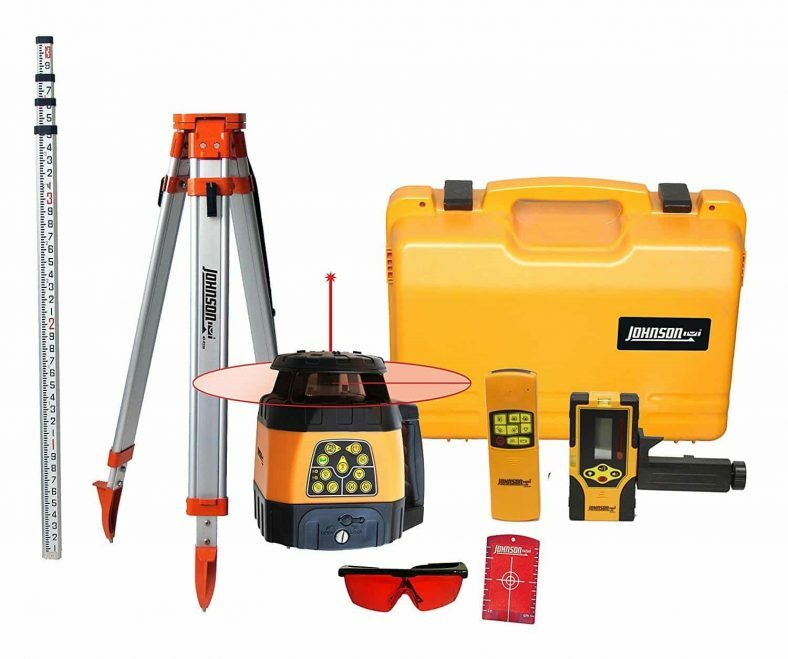 Often, a self-leveling rotary laser level kit comes with mounting accessories that clamp to virtually any object or stick magnetically to steel beams. The best self-leveling rotary laser for working on rugged terrains and hilly places should have a tall stand. Such a stand allows the transmitter to send signals over a hill. Also, the stand should be stable and adjustable. The best material for a good stand is aluminum or alloy because it is durable and lightweight. You need a transmitter that compensates for slopes when working outdoors. Many times, the natural terrain comes with ups and downs. The best rotary laser should compensate for a slope of up to 5⁰. In addition, 90⁰ levels come in handy for indoor construction as they project both horizontal and vertical beams on walls. When shopping, be aware of this feature because not all models provide vertical beams. Limiting the rotation angle of the diode keeps the laser on the targeted surface more frequently whether you are working indoors or outside. While indoors, you should keep the diode visible. When you’re outside, keep the diode on the receiver and avoid flashing your coworker’s eye with the laser beam. An LCD indicator and audible sound are great features but some people find the sound annoying. The receiver beeps constantly until a level line is attained. It beeps more frequently and louder as it nears a level line. The LCD indicator has an up or down arrow that shows whether the line is close to being level. How Does A Rotary Laser Level Work? Rotary laser levels can do a variety of jobs to determine level reference and accuracy of a layout. Some activities are small e.g. hanging artwork, while others are big e.g. site grading for a new house. A rotary laser level rotates a level line 360⁰ around the entire surface. Some can be laid on their side but most of them are mounted on a tripod stand. When a single laser rotates, the human eye interprets it as a line around the surface. Most of these tools work indoors. To use them outdoors, a laser detector/receiver is required so that the eye can see the laser beam in daylight. It also produces a sound and LCD light as you get close to a level ground. 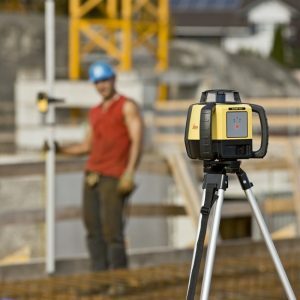 We will give the best rotary laser level reviews to help you determine a suitable model for outdoor construction. In our rotary laser levels reviews, we will mention self-leveling tools with internal pendulums. These models are different from automatic-leveling lasers which come with electronic servo motors for leveling. Pay close attention to the features to understand the differences before making a major purchasing decision. Not every product that claims to be a laser level for homeowner is a big league investment. That is why Home N Roll posted this rotary laser level review to help readers make an educated decision when it comes to choosing one. In no particular order, here is a side by side comparison list of laser levels we consider as the best in the current market. We have chosen a range of top rotary laser levels from low to high end to make sure they suit all budgets. At the end of the day, you want to pick the best rotary laser level for the money. Let’s dive into more detail of each model. 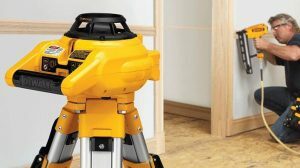 The Dewalt rotary laser is a top-notch model that adjusts automatically both the vertical and horizontal level line. 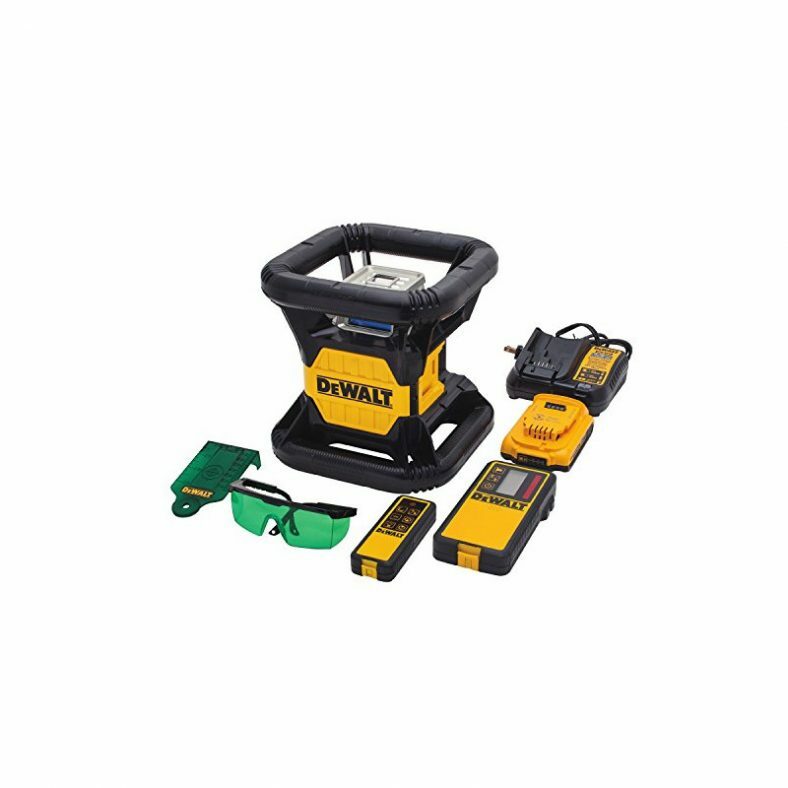 If you need an accurate rotary laser level for outdoor leveling, an accuracy of 1/8″ by the Dewalt DW079KDT model can suffice. Even though it is not sufficient for indoor use, we highly recommend it for commercial purposes. 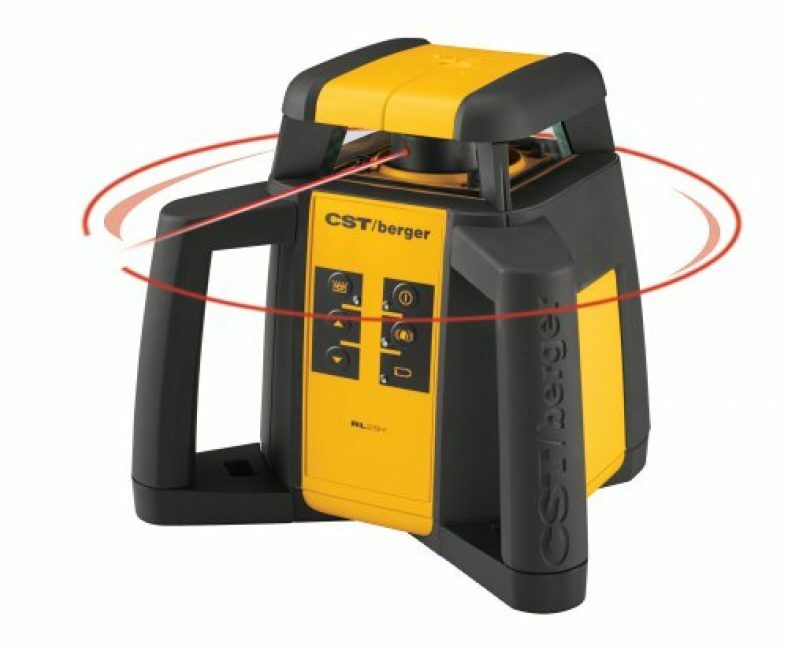 The CST Berger laser level is defined by its durable design that protects sensitive components against impact and bad weather. As you’ll see, the rotary laser provides more features than most of its competitors. The tough construction design of the Berger rotary laser level makes it one of the best tools for outdoor use. With an accuracy of 3/32”, you won’t find a better product at this price point. Here is a superior one-man leveling tool in its class. It is precise, efficient, and professional even in the toughest working conditions. If you are a mid-size contractor seeking a versatile leveling system, then the Trimble spectra rotary laser is the best tool for you. You can use it in excavation, dirt moving, and concrete work. 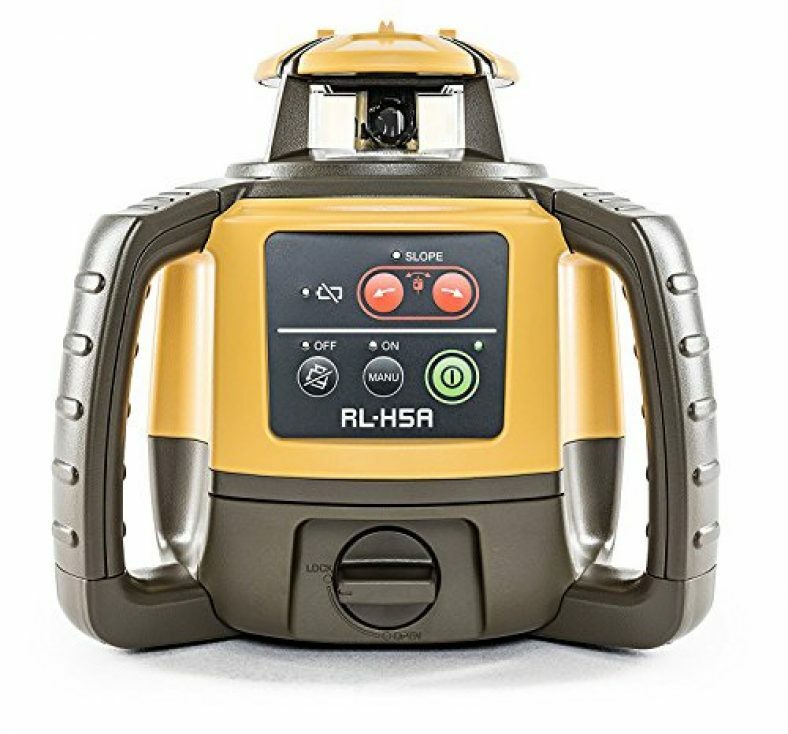 Johnson rotary laser level can be applied to a plethora of jobs including alignment of posts, leveling footings, excavation, planting beds, etc. It is the most economical best self leveling rotary laser level on our list. We recommend Johnson 99-006K for small projects. It has all the important features you would want for various home applications. It is also suitable for professionals who need to determine accurate line levels quickly. Topcon rotary laser level is an incredibly easyto use tool. With a single press on the power button, you can start working in a second. It levels automatically thanks to precision motors with an accuracy of 10arc seconds. 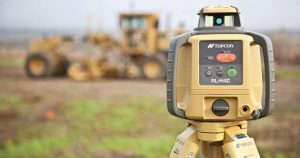 Topcon RL-H5A has found favor among professional builders and DIY hobbyists thanks to its functionality. We tested the product and indeed it performs as advertised. We particularly love its ability to cope with drops. Bosch is known for producing time-tested power tools and this self leveling rotary laser level is a good example. 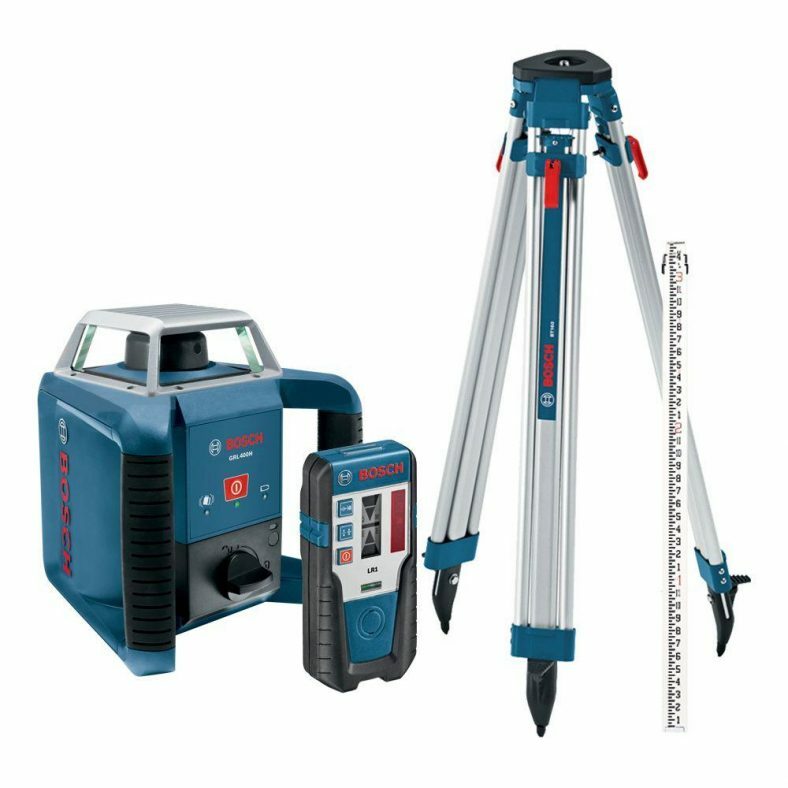 Bosch GRL300HVCK provides quick vertical and horizontal leveling in addition to a 90⁰ layout laser beam. Its beam visibility enhancements can help you do your job with ease. 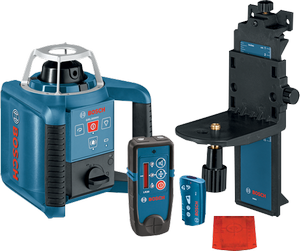 By projecting a 360⁰ beam, you can easily draw a chalk line on a plane using these self leveling rotary lasers. Bosch rotary laser level has an impressive array of features that can help you accomplish any form of construction or remodeling task accurately. You can use it to install windows, place wall studs, level surfaces. What’s more, you can use it in any form of lighting as you transport it from one site to the other using the carrying case. With respect to the features, pros, and cons of our highly recommended products, you should be able to find the best rotary laser that meets your needs. It doesn’t matter whether you work as a designer in a workshop, or on large commercial projects, you can expect excellent performance from the 6 rotary laser levels. We picked them with high performance in mind. However, we cannot forget to mention our winner which is the Trimble Spectra Precision Ll300. This tool does it all, not to mention its high speed, accuracy, and ability to withstand drops and tip-overs. It is designed for both professionals and DIYers who want to accomplish tasks in the fastest time possible without compromising accuracy. 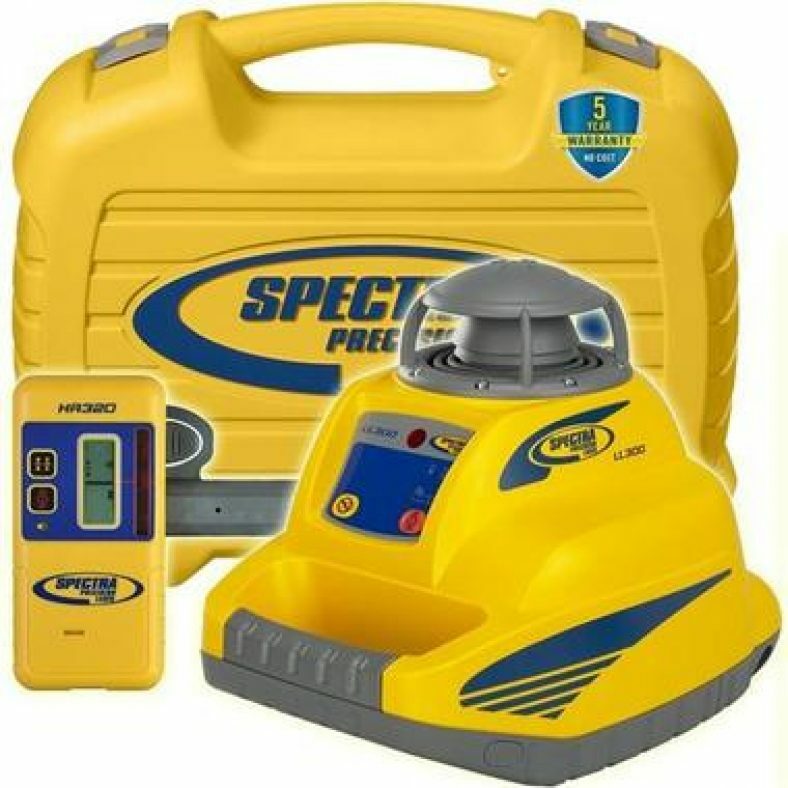 Regardless of the weather and job site nature, you can always rely on Spectra Precision Ll300.